The Warhammer: Chaosbane devs have revealed the game’s fourth and final character: a Wood Elf Waywatcher named Elessa. Her background and abilities are discussed in a new trailer, which you can watch below. Apparently she made her name “as a scout in Magnus’s army” – that’s a referece to Magnus the Pious, a hero who reunified the Empire of Man and led it to victory against the dark gods of Chaos. Chaosbane is set shortly after those events. 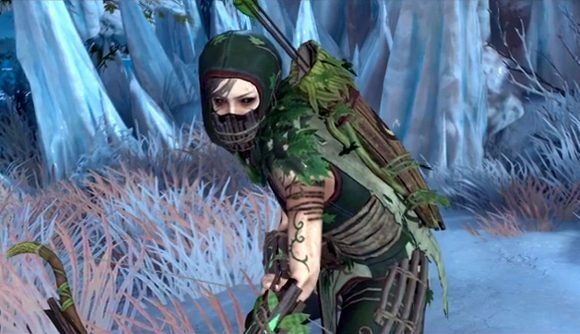 In gameplay terms, Elessa is an agile-but-fragile ranged DPS and debuffer. The trailer explains that all of her abilities deal damage over time, and allow her to sow confusion among the enemy by slowing them, poisoning them, or inflicting other debuffs; she can be seen throwing out rows of thorns that trap and steadily damage enemies. She’ll struggle in melee combat, but has the base speed and a handy dodge-roll to get out of trouble. She can also summon dryads – a much more robust combatant, given that they’re made of wood – to keep enemies occupied. Warhammer: Chaosbane is a Diablo-inspired, loot-fuelled action-RPG. It will feature four playable characters, designed to work together as you cleanse four different cities of the taint of the four Chaos gods. The tanky Empire Soldier and ranged High Elf spellcaster were both revealed at its announcement last year, while I got to have a go with the Dwarfen Slayer – your melee DPS – a couple of months ago. Based on that experience, Chaosbane is shaping up really well. Warhammer: Chaosbane’s release date is currently set for June 4. For more information, you can check out its Steam page – pre-orders are live already if you’re already convinced. The base version will set you back $49.99 (£39.99), but if you’re feeling flush, the deluxe edition and Magnus edition will get you some digital goodies and four days’ early access, or that plus the season pass, respectively.